Hamas terrorists have fired thousands of rockets into Israel from Gaza. What is remarkable is not the Israeli response, but the Israeli restraint in the face of aggression no other country would be expected to tolerate. The pro-peace and progressive communities must speak out forcefully in support of Israel. A two-state solution is impossible as long as Hamas terrorism continues. President Obama has backed Israel in this latest crisis. Rep. Jan Schakowsky (D-IL) condemned Hamas and issued a statement unequivocally supporting Israel’s right to self-defense. Congressman-elect Brad Schneider (D-IL) also issued a strong statement condemning Hamas’s attacks on Israel and supporting Israel’s right to self-defense. The US Senate and House unanimously approved a resolution supporting Israel on November 15. For this to happen in two days with everything else on the Congressional agenda is a remarkable display of US support for Israel. AIPAC praised President Obama’s strong support for Israel as well as strong support from both parties in Congress. Since his re-election, President Obama has spoken out against the unilateral declaration of a Palestinian state at the UN, reiterated his firm commitment to preventing Iran from obtaining nuclear weapons, and forcefully condemned Hamas while supporting Israel’s right to defend itself. So much for Republican claims that President Obama would be less supportive of Israel in his second term. Some of you are receiving this via campaign email addresses that may soon expire. To ensure that you continue receiving this newsletter, please reply to this email with a more permanent email address. Hamas terrorists have fired over 12,000 rockets from Gaza into Israel during the past 12 years. Hamas has fired over 800 rockets into Israel since the beginning of the year, over 120 in the week before Israel began Operation Pillar of Defense, and hundreds more since then. No country would tolerate this terror for as long as Israel has. No country should have to tolerate even one rocket, let alone 12,000. Millions of Israelis are within rocket range and have only 15 seconds from the time the sirens sound to run to a shelter. I want to remind you that, seven years ago, Israel withdrew from every square inch of Gaza. Now, Hamas took over the areas we vacated. What did it do? Rather than build a better future for the residents of Gaza, the Hamas leadership, backed by Iran, turned Gaza into a terrorist stronghold. They fired thousand of rockets at our cities, at our towns, at our civilians, at our children. They’ve smuggled thousands of rockets and missiles into Gaza, and they deliberately place these rockets and missiles in civilian areas: in homes, in schools, near hospitals. This year alone, they fired over one thousand rockets and missiles at Israel, including close to 200 rockets in the last 24 hours. I’m stressing this because it’s important to understand one simple point. There is no moral symmetry; there is no moral equivalence, between Israel and the terrorist organizations in Gaza. The terrorists are committing a double war crime. They fire at Israeli civilians, and they hide behind Palestinian civilians. And, by contrast, Israel takes every measure to avoid civilian casualties. I saw today a picture of a bleeding Israeli baby. This picture says it all: Hamas deliberately targets our children, and they deliberately place their rockets next to their children. Despite this reality – and it’s a very difficult reality – Israel will continue to do everything in its power to avoid civilian casualties. Israel’s response was neither excessive nor disproportionate. What would a proportionate response be? Firing a missile into civilian areas of Gaza every time Hamas fires a rocket into civilian areas of Israel? There is no moral equivalency or “cycle of violence” here. 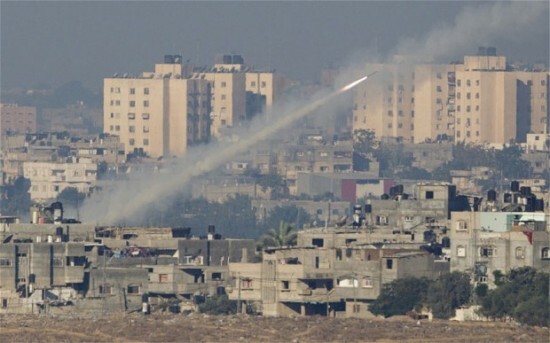 Hamas fires rockets into civilian areas to terrorize Israel. Israel attempts to end the rocket fire by targeting those who are doing the shooting. Since Hamas deliberately operates from civilian areas, some loss of innocent life is inevitable, no matter how hard Israel tries to avoid it. To compare Israel’s deliberate, surgical killing of Hamas terror chief Ahmed Jabari with Hamas’s deliberate targeting of civilians is itself immoral. Hamas brought this on itself and its people. We will also hear that more Gazans than Israelis were killed in the recent fighting. This is partly because the Iron Dome batteries the Obama administration provided have intercepted some of the missiles, partly because Israelis are trained to find shelter as quickly as possible, and partly because even though Israel targets military sites, Hamas places the military sites in civilian areas. Palestinians in Gaza are suffering terribly from Israeli air strikes. The death of any innocent person is tragic. This latest round of fighting will result in more suffering and dying within Gaza. It will also breed more hatred toward Israel. No one should be happy about it. The problem is that Israel has no choice. The UN is not pressuring Hamas to stop the terror. The Arab countries are not pressuring Hamas to stop the terror. Israel had to act to stop the terror, and while Palestinian suffering is undeniable, the blame rests solely with Hamas, not Israel. How much force should Israel use? Enough to stop the rockets, whatever that might take. If the Arabs were really concerned about their Palestinian brethren, instead of running to the UN to condemn Israel, they would have already run to the UN to condemn Hamas for its terrorist rocket strikes. Instead of financing Hamas, they would cut off financing for Hamas and try to strengthen the Palestinian Authority. They would realize that the goal of a Palestinian state living side by side with Israel in peace and security can only be achieved by showing the Israeli public that a two-state solution can work. How can the Israeli public be expected to support a Palestinian state in Judea and Samaria (the West Bank) after this? Most Israelis understand that a two-state solution is the only solution that will allow Israel to remain democratic and Jewish, but they also understand that any solution must allow Israelis to stay alive. Hamas is making the case that ceding the West Bank could be national suicide. Rep. Jan Schakowsky (D-IL) said on November 15 that “Hamas’s ongoing use of indiscriminate violence against Israeli is harmful to the cause of Palestinian statehood and dangerous to the Palestinian people in Gaza. Its oppressive regime has caused immense suffering.” Read all of Rep. Schakowsky’s condemnation of Hamas and unequivocal support of Israel’s right to defend itself here. The pro-peace community in the United States must speak out forcefully against Hamas and in support of Israel’s right to self-defense. Now is not the time to tell Israel to exercise restraint or to remind Israel that military action alone cannot solve the problem, as if Israel does not already know that. Now is the time to acknowledge that those of us living thousands of miles away from Israel, in peace and safety, are not in a better position than Israel to determine how best to protect their families and loved ones. Instead, the pro-peace community should focus its efforts on rallying world-wide condemnation of Hamas and their terrorist allies. if progressive American Jews ask me why Israel can’t just muddle through, my answer is this: Israel came into being so that Jewish children would never again have to huddle together in fear, terrorized by enemies of the Jewish people, while their parents stood by helplessly. Helping those children is a progressive cause. And doing nothing for them undermines the sovereignty of the Jewish state and strikes a fatal blow at the very raison d’etre of Zionism. See this a one-minute video showing a mother’s perspective on the affect of rockets on children. To achieve peace, the Palestinians must start preparing their own people to accept the reality and legitimacy of a permanent Jewish state of Israel. They must also prove to Israel that it can cede land to the Palestinians without fear of creating yet another launching pad for attacks on Israel. Israel will have to make painful concessions to accommodate yet another Arab state in the Middle East, including relinquishing sovereignty over areas of the West Bank that have been Jewish for centuries. That’s hard enough, but worth it for real peace. But to expect Israel to make those sacrifices when it is understandably concerned that its neighbors still seek its destruction and are willing to terrorize Israel with rocket fire is unrealistic and unreasonable. Israel’s quarrel is not with the Arab Palestinian people, but with the Iran-backed Hamas terrorists who run Gaza. Indeed, Israel has endorsed a two-state solution and consistently proposed peaceful solutions, even willingness to trade land won in defensive wars for a promise of peace, only to be rebuffed again and again by intransigent Arab Palestinian leadership. But even as Israel strives for peace with its Arab neighbors, it cannot be expected to forsake the primary duty of any state: to protect the safety and security of its citizens. We would expect no less from our government if our children were subjected to daily rocket attacks at home and at school. Israelis in southern Israel have only seconds of warning to race to the nearest bomb shelter, and if kids are in different rooms, that means a split-second decision regarding which kid to grab and which kid to hope makes it to the shelter on her own. No government can permit its citizens to live that way. Read more about what it’s like here. Since his re-election, President Obama has spoken out against the unilateral declaration of a Palestinian state at the UN, has again stated that “we’re not going to let Iran get a nuclear weapon,” and has forcefully condemned Hamas and unequivocally supported Israel’s right to defend itself in Gaza. So much for Republican claims that the “real” Obama would abandon Israel in his second term. The real President Obama is who we saw last week and who we’ve seen for the past four years. We have a friend in the White House. Republicans who are sincerely concerned about Israel should be relieved. Republicans who don’t want to pay their fair share of taxes, though, better start worrying. The US Congress also stands behind Israel. On November 15, the United States Senate sent an overwhelming message of solidarity with Israel, passing by unanimous consent a resolution introduced by Senators Kirsten Gillibrand (D-NY) and Mark Kirk (R-IL) that very same day. This bipartisan resolution, with 62 Senators as co-sponsors joining Gillibrand and Kirk, expressed firm support for Israel’s “inherent right to act in self-defense to protect its citizens against acts of terrorism.” On November 16, the House passed unanimously passed an identical resolution, introduced by Rep. Ileana Ros-Lehtinen (R-FL) and Rep. Howard Berman (D-CA). Click here to read the resolution. For statements from other elected officials, including Rep. Robert Dold (R-IL), click here. Congressman-elect Brad Schneider issued a statement condemning rocket fire from Hamas and supporting Israel’s right to defend itself, noting that he has personally visited many of the Israeli communities now under fire. AIPAC on Thursday praised the Obama administration’s strong support for Israel’s self-defense, as well as the strong support members of Congress from both parties have given Israel amid the Gaza fighting. Read more here.